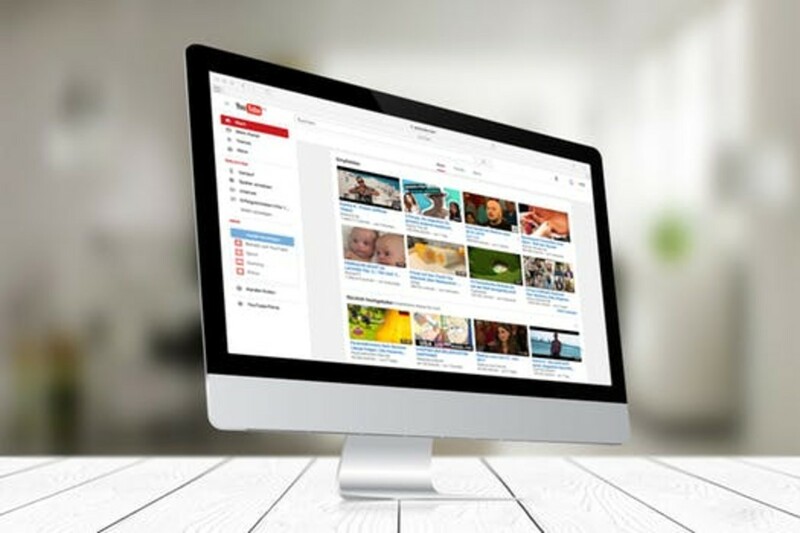 Below, you will find lots of inspiration as well as the best video how-tos and free templates that I have found online. I've also included a list of the different types of pop-up mechanisms you can use. V-Folds are very versatile and are where a V shape pops up when the card is open. 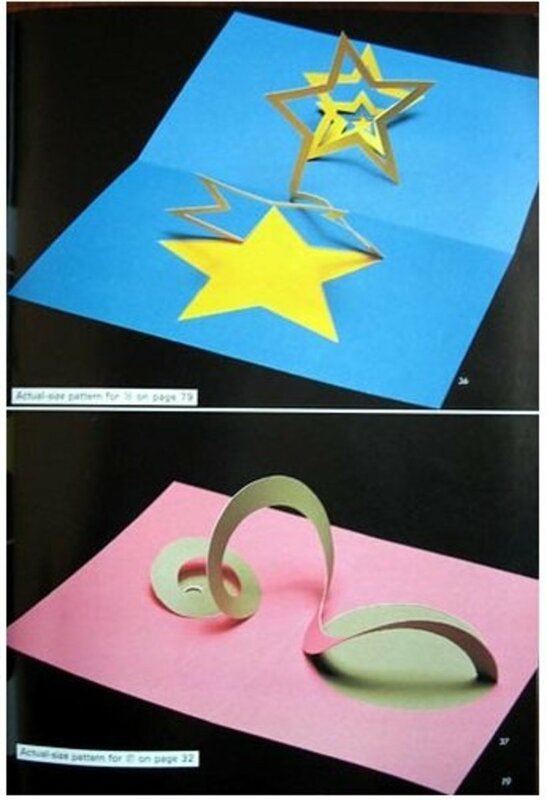 They can be cut and folded directly into the main piece of card, or they can be created by adding an additional section of card for the pop-up shape. (It might help if you view an animation of a V-fold.) To create a more advanced effect, you can even add V-folds on top of other V-folds for more layering, and you can also create a V-fold lifter which produces an impressive floating effect. An asymmetrical V-fold pivot is another impressive effect which produces a side-to-side movement. Box Folds (also called interval stands or layers): By contrast, these are created using parallel horizontal or vertical fold in order to produce 3D box shapes rather than making use of V shaped angles. 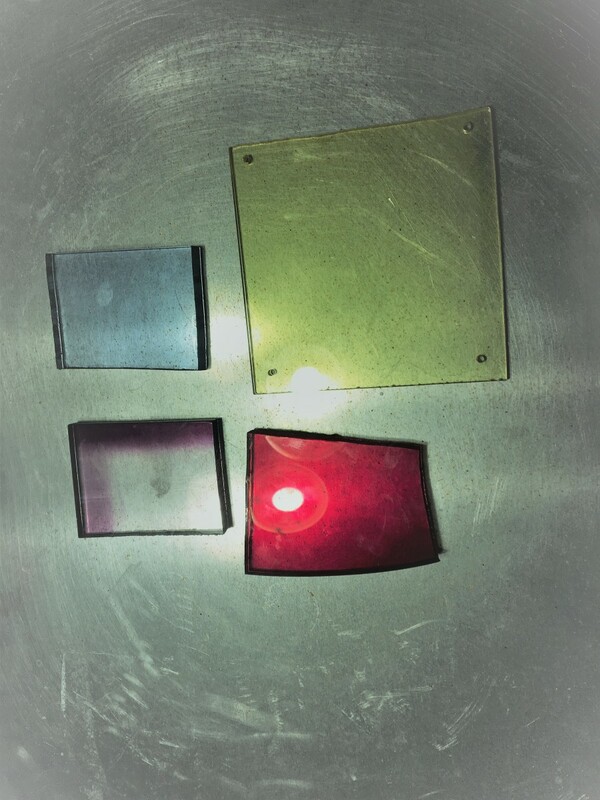 You can leave these boxes as is, or glue other shapes onto them. 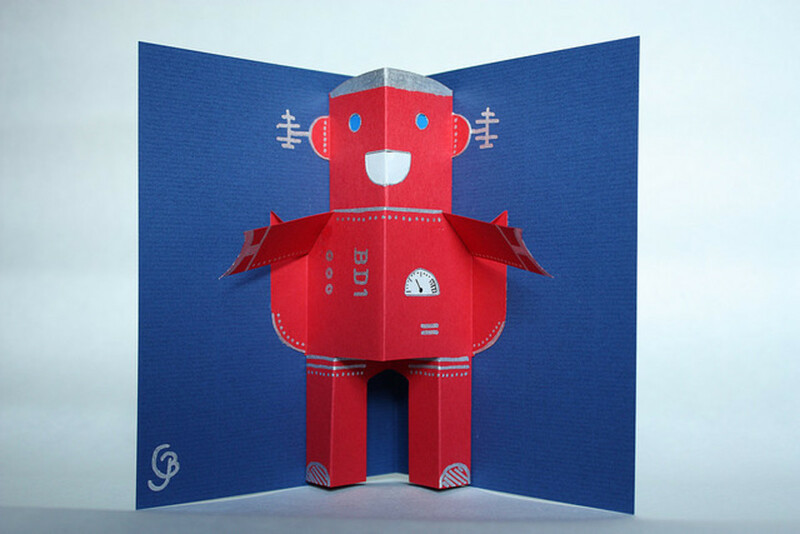 They can be created by cutting directly into the folded card first, as explained here and here, or the boxes can be made with additional pop-up card sections onto the folded base card. Of course, if you cut the boxes directly into the folded card, you will be able to see through the gap in the card unless you add a backing. Combining the Two: For more advanced techniques, you can also build extra boxes onto other boxes to create more and more layers, or you could build boxes onto V-folds and V-folds onto boxes! The box (or step) technique is the first thing to learn as a beginner, as you will see this technique used in many cards, both simple and advanced. It is an important mechanism to know. The solid black vertical lines are where you cut through the paper with scissors or a craft knife. The red lines are valley folds, which are easier to do if you use something pointy (but not sharp enough to go through paper) such as a bone folder to score a horizontal line where you intend to fold. Scoring the paper makes it easier to achieve a sharp, straight fold. The blue lines are hill folds and are created last, along with the 'fold line.' Fold the piece of paper/card along the fold line whilst pulling the three strips of paper you have created inwards (towards you). 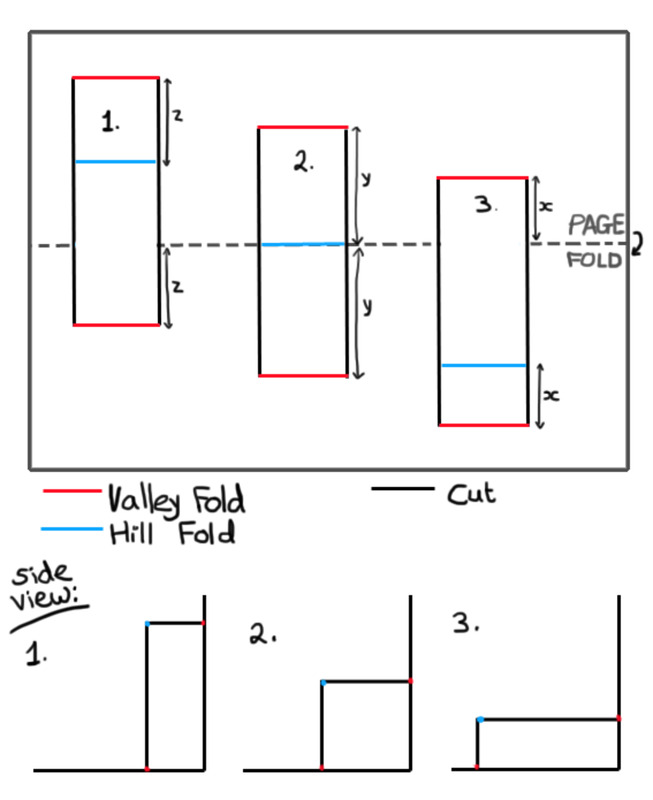 Squashing the paper strips between the folded paper sheet should result in hill folds, so long as the paper strips remain flat and straight, and the (red) valley folds remain correctly folded. You will find that the shortest distance between the fold line and a valley fold is equal to the distance between the hill fold and the other valley fold (i.e. x=x, y=y, z=z). The dashed line represents the fold line where the sheet of paper has been folded in half lengthways, like you would do if you were making a landscape layout greetings card. The bottom of the diagram shows the side profile of each of the three paper strips, when the paper is folded (along the fold line) to a 90 degree angle. So, changing where you make your cuts and folds changes the heights and sizes of the pop-up boxes. Please note: Because the boxes are created within that one sheet of paper/card, there will be gaps behind the boxes which you'll be able to see through. You would therefore need to add another sheet of paper/card as a backing like this. Or, you could make the paper strips from separate pieces of paper and add 'glue flaps' at each end so you can glue them to your card in the correct place without cutting into your base card at all. The open-top box which turns the box shape on its side. The floating table-top plane which is where a piece of card seems to float in the air but is in fact supported by boxes. Mouth folds: Mostly used to create the effect of an opening and closing mouth. Tabs and Slots: This is a slightly more complicated mechanism which you can add onto a card to produce a sliding movement. The tab can be pulled and pushed to produce the movement, or an automatic sliding tab can be made so that opening and closing the card will activate the tab. An X Mechanism: Created by cutting slits into two identical shapes so that they can slot together, and then placing this 'X' onto a box mechanism on the base card. Rotating spinning discs: Attaching a card disc to the main card using a split pin allows the disc to be spun around. Different images are printed around the edge of the disc so that rotating it allows the displayed image to be changed at will. Adding a Rotator produces a rotating movement. For information on even more techniques, check out Popular Kinetics. 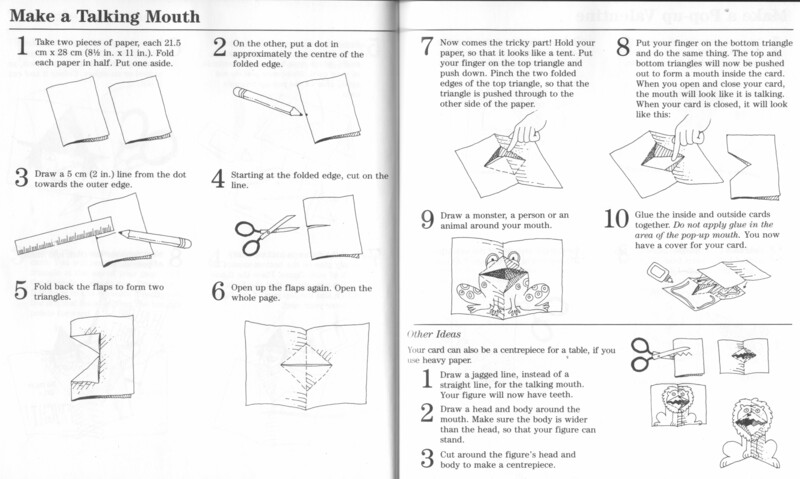 The mouth fold does exactly what it says— it creates a fold that looks like a mouth opening closing when you open the card! 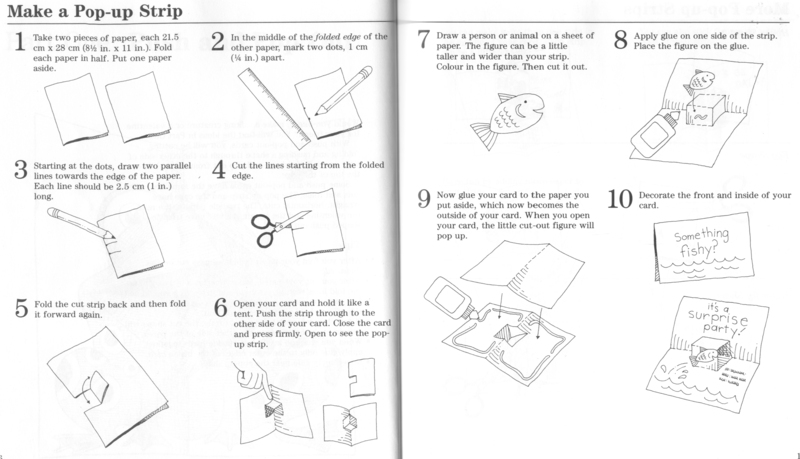 Fold your card (or paper) in half. Measure where the center line is (shown in red on the diagram). You don't need to mark this out unless you want to (in pencil). It doesn't have to be exact. 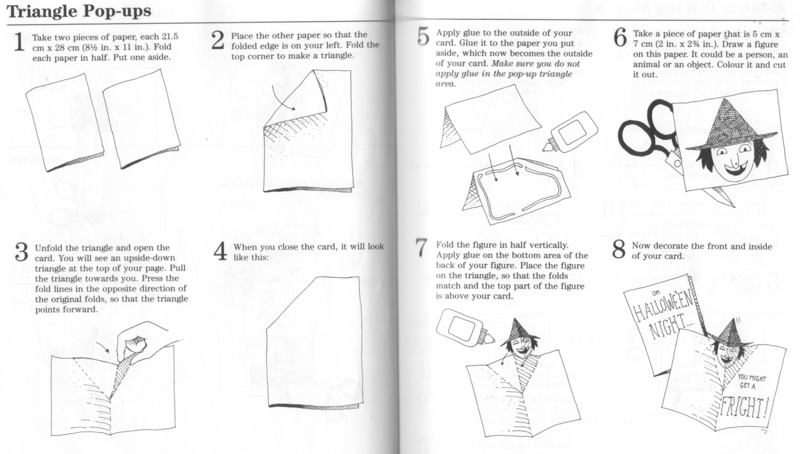 Fold the card corners outwards from where you just cut so that they are folded at a 45 degree angle, as shown in the diagram, to form two triangle shapes. 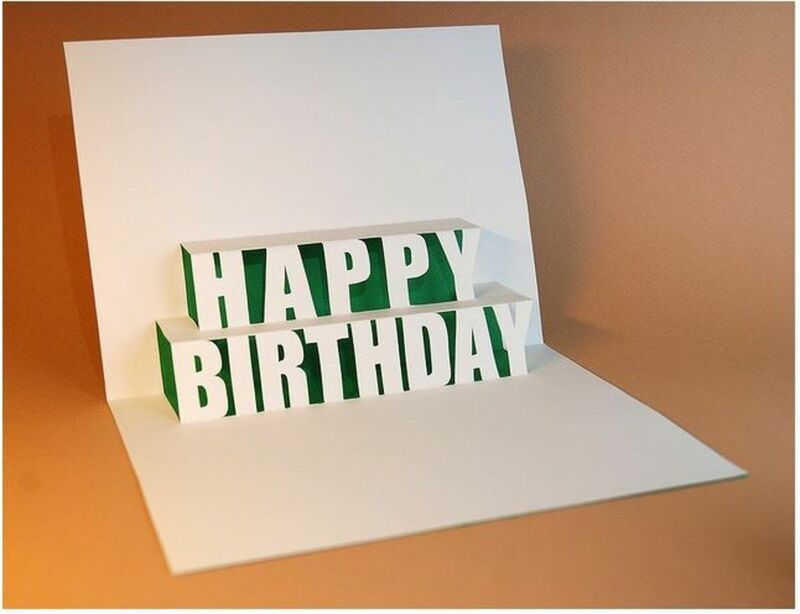 Do the same on the other side of the card so that the 45 degree folds (shown in green) have been folded both forwards and backwards. Put the card flat again and open the card out. 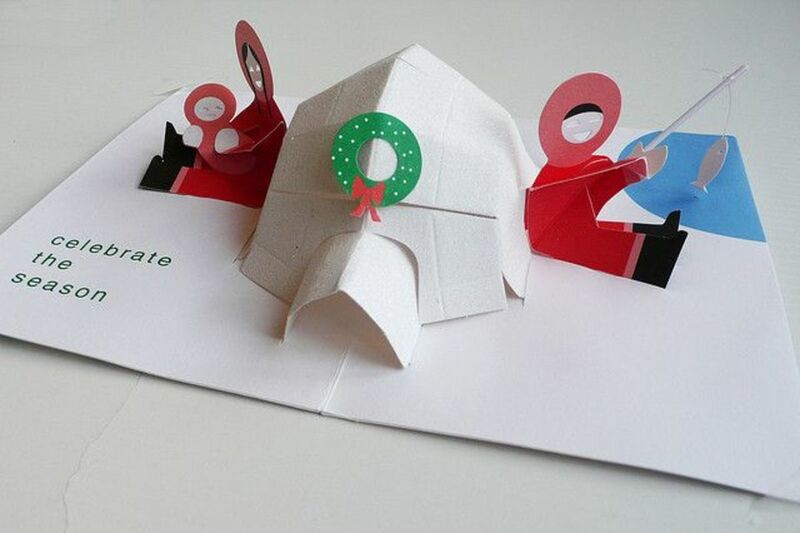 Push the folds inwards, to the inside of the card and fold the card in half again. Press down onto the folds to crease them once once. You should now be able open and close the card to open and close the mouth. Finished! Easy technique for animal-themed designs. Another simple way to add 3D detail. Excellent collection of video lessons covering basic techniques. More interesting than the normal plain strip. Just cut out the shape outline, leaving tabs where it attaches to the card. A step-by-step walkthrough of kirigami techniques. 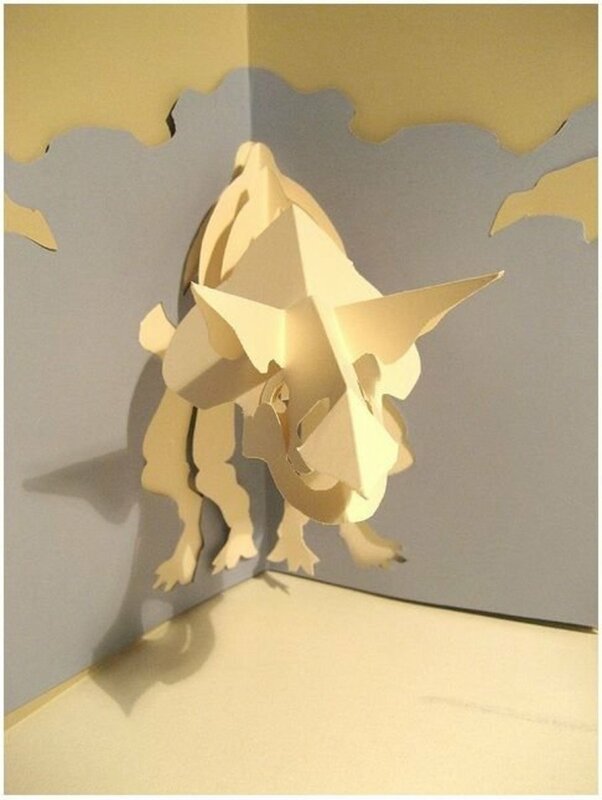 Impressive pop-up designs made using paper cutting techniques. Red and white card design, perfect for Valentine's Day. Produce an amazing spinning effect. User-submitted how-tos for hearts, 3D rooms, picnics, and more. Anybody would love to receive this for Christmas. Cute idea using photos for a personalized look. Free font which will make lettering much easier. Including a tea set, a paper crane and fighter jets. Make a card which closes the tigers mouth when opened. Spooky Halloween design with a detailed printout available. Amazing resource with templates for every occasion. Glittery Christmas tree design which would look fab on a mantelpiece. Just buy a ready-made pumpkin paper lantern! Sweet homemade design with pop-up multicoloured balloons. How to make a honeycomb centre for a flower. Fun triangle pop-up made by cutting out strips. 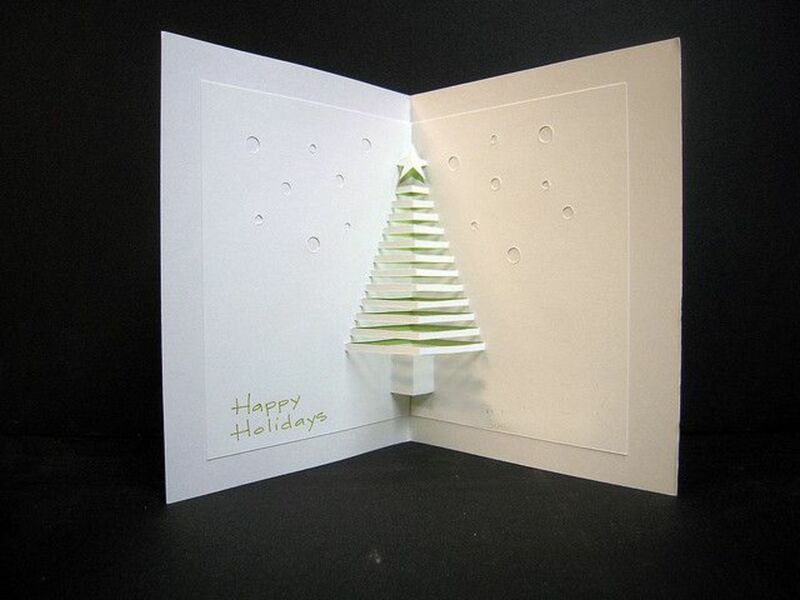 Lovely detailed 3D card with a sliding effect. A different pop-up technique using a spinning wheel. Nice idea for using patterned paper or card as the backing. Pull-apart card design with a pop-up surprise tab. Cool house, cat and more building patterns. Pages of photos of pop-cards from Flickr. Creative and crafty pop-up designs. A fantastic array of designs which are pretty cheap to buy. Brilliant 3D design made of lots of paper blocks. DIY idea for creating your own fun hand gestures. A blog full of imaginative examples and a few tutorials too. Have you ever made a pop-up for someone? wow- this is an amazing page! so many ideas and info.!! maybe you can help me out- i've made a pop up page for a mini album and the when i open the page- the images doesn't stand straight- they lean forward a bit. is there a way to improve it? thanks! I like Blue 2 video. My question is how or where do go to publish a pop up book for a reasonable price. This is very useful for beginners. thanks lot. Wow this is awesome! Stunned at the carousel pop-up card! This is pretty cool and awesome. 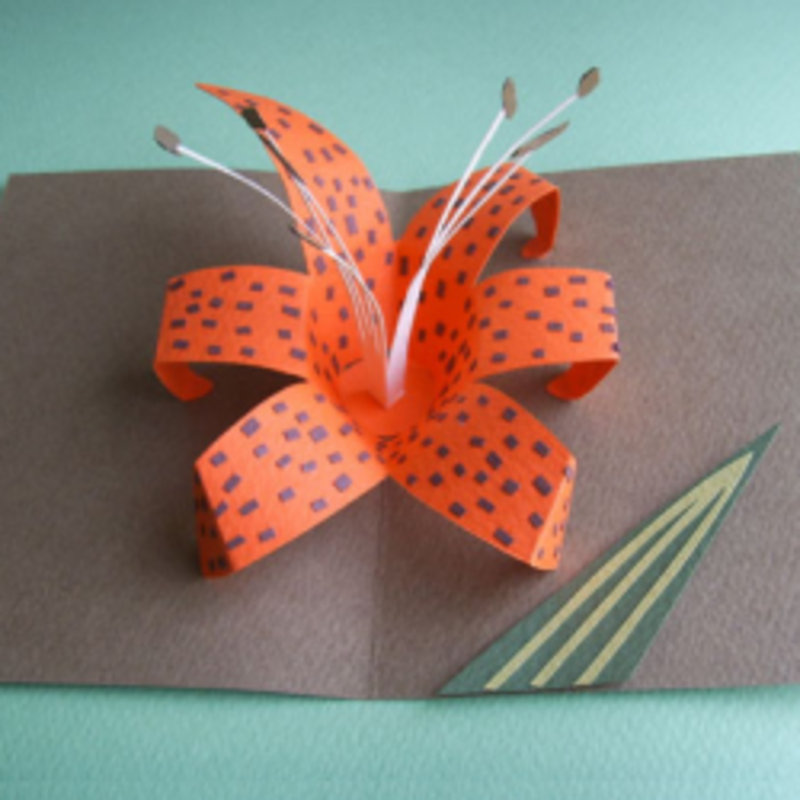 I loved that tiger lily kirigami. 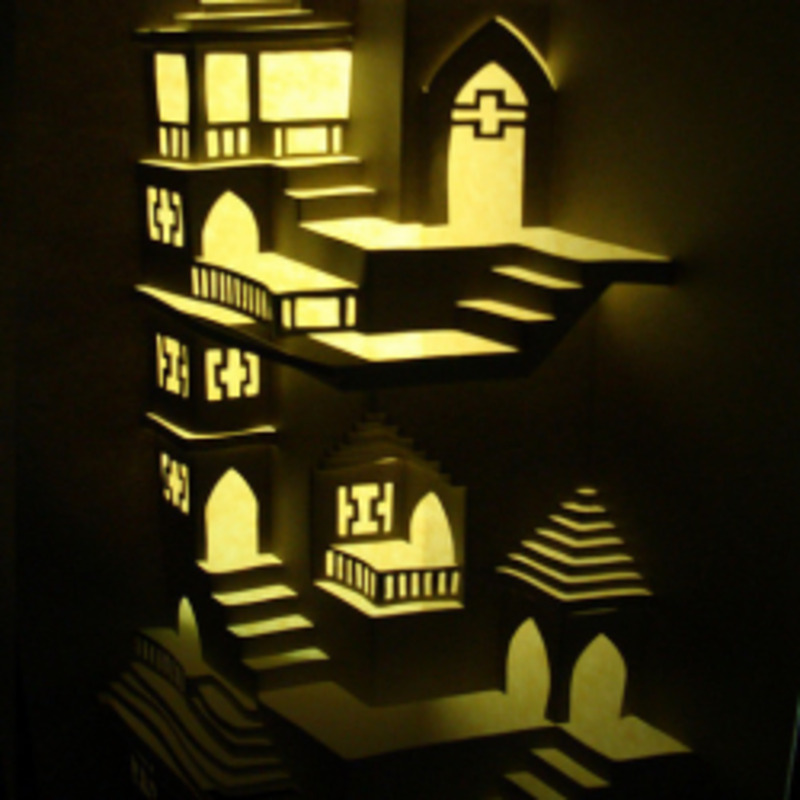 I never heard of kirigami before. Thanks for sharing this lens. Try to make a pop up gift by following your tutorial. What a clever and ingenious idea! I love it! It's also so cool! I would love to make this this year or try it next year. 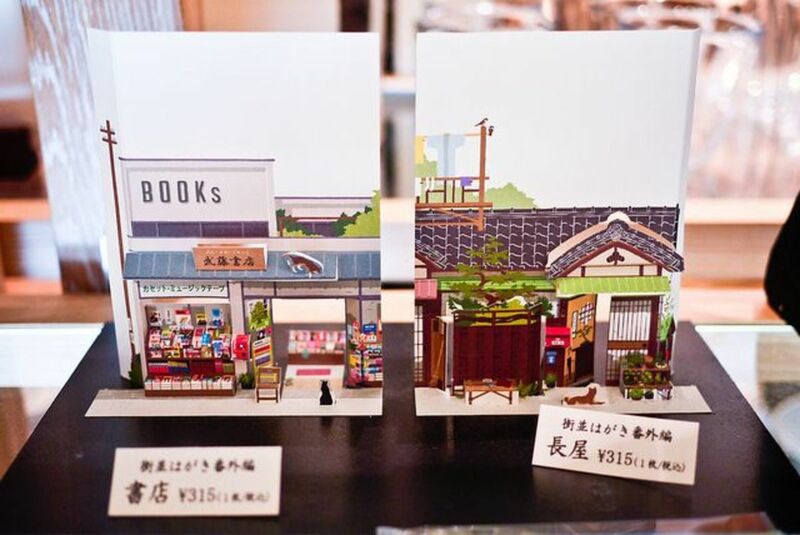 Thanks for all the info and beautiful photos of pop up cards. Ever since I was a child I have loved them. 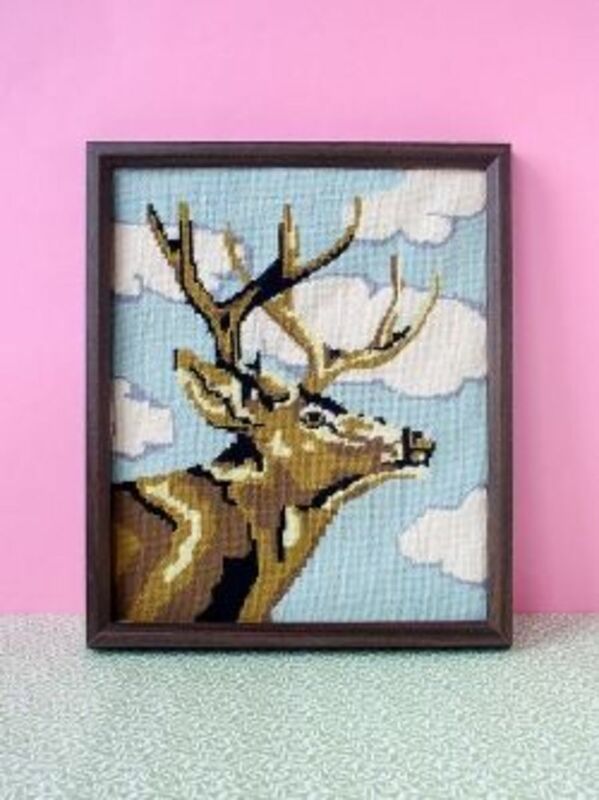 I just liked to check on crafts and art ideas every time I am tired of the views of forms and spreadsheet on my screen.. great ideas you have posted here.. will be noting some of the recommended designs for my collection.. Thanks! You are right...a card is always such a nice little surprise to receive. I have made a few pop up cards but am not fabulous at it. You have such an extensive collection here...I am bookmarking and pinning. This is such a great idea. When I was very young, I loved these pop-up-cards, and still do (but don't tell anyone). Thank you for showing us how to make them. You are very creative. Now I can make my little cousins (I've got two) some of these. So many memories were sparked from reading this. The Super Mario scene with the Koopas was very nostalgic. The lens in general brought to mind a pop-up card I made to accompany a class project where a lot of trial and error took place; I didn't measure correctly so some elements protruded out of the card once folded. It took a while but it finally worked out; except the missing letters on the banner. Lovely lens. Now I got so more projects to dive into. Thanks for sharing! I would love to do this just for fun. I believe this summer I'm going to try to simple ones to start out and I certainly want to try the tiger lily, that is awesome. You're lens is a Great Example For Others. Very nice lens, love your creations. Cool, its definitely worth to try! I'm thinking of my son- he loves making pop-up cards and there are some great ideas here that are easy enough for him to do! Interesting and creative lens! Thanks! I love these - the tiger lily is fabulous. We love pop-ups and we base our ideas around them too! We just love the way they allow us to interact with the material, especially with photos and mementos. This is a very nice lens! What's not to love about this? :) I like the Floral Bouquet pop up card! Really really fantastic! Thumbs up! Great Lens! Personally, i like the simplicity of the fjord card. I'll have to google Rosa to see what else she has out there for great designs. Wow. Awe-inspiring. I've never seen such intricate, elaborate pop ups. The sculpture video is amazing; and that tiger lily flower, I thought was real at first glance. Incredible stuff, what a great lens. Great lens! I am really excited to try some of these ideas. Tons of resources here. Gorgeous designs! I love pop up cards. Thank you for showing how it is done. Enjoyable lens! These are all very nice : D I made a pop up Tardis (Doctor Who) card once. Thanks for the information. I will try making my own pop up cards. 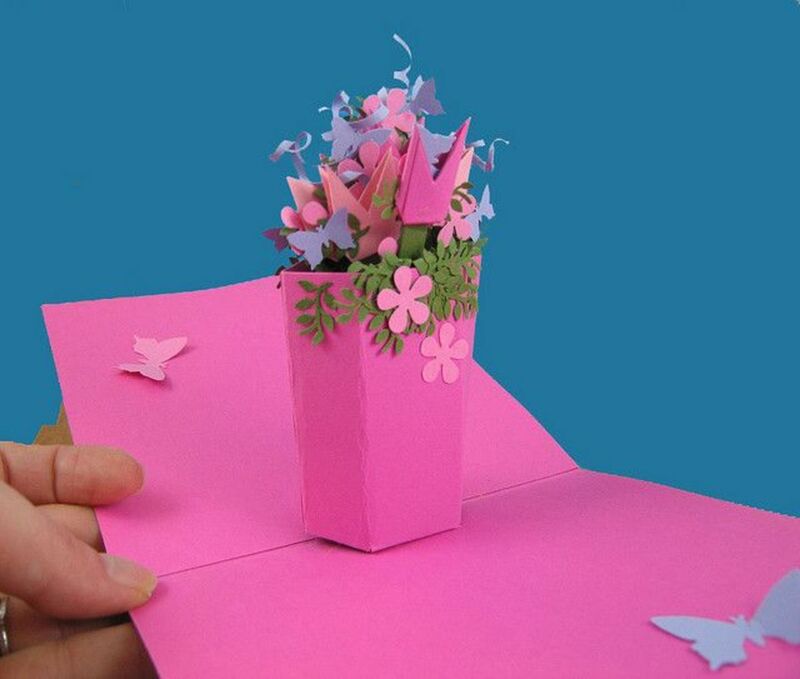 I want to master the art of making pop up cards!!! Great lens...my creative mind is already whirling with ideas for this Christmas. Amazing!! I think these are great!!! Great lens!! Awesome lens! 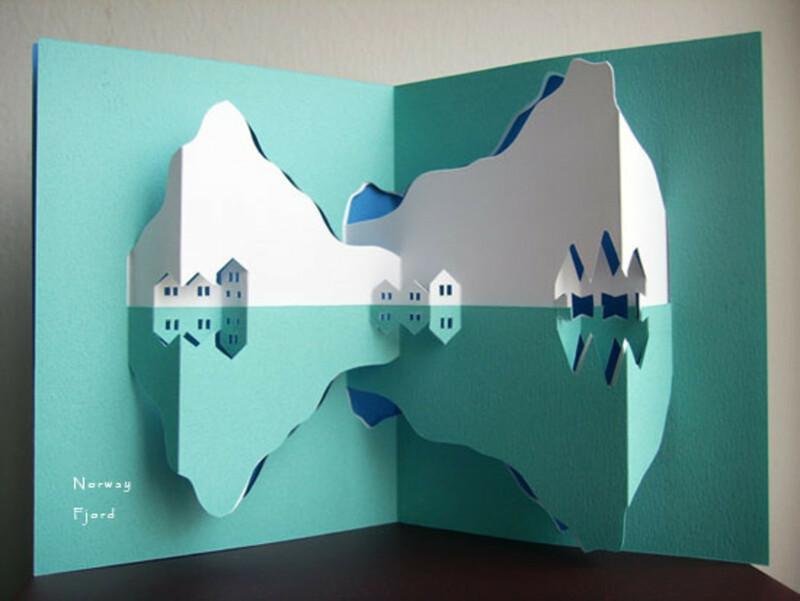 I love the Norway Fjord pop-up card. Very cool lens. 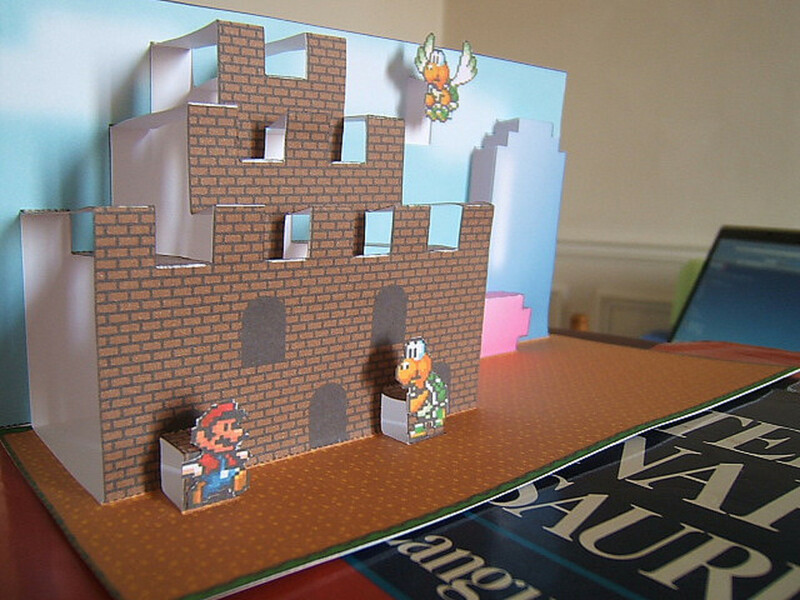 I have made some pop up cards, but not as intricate as these. I like to make pop-up cards :) Very nice lens, I found a bunch of ideas for cards! cool. Did it take a lot of time? Wonderful ideas and designs. You have inspired me to try this! Thanks! I've included it on my Favorite Lenses lens under the creative DIY section. (not sure if I missed it, but was there a link how to male the Tiger Lily one? That dinosaur pop out looks like it took awhile to make. I can't imagine trying to get some of these open up inside a greeting card. wow my dream to make pop up cards, I can learn now, so happy, thank U!